Lost your Windows 7/Vista/XP password and cannot log in to your machine? If you have a rescue disk, you should be okay. If not, you might have to turn to BackTrack Linux for help. Microsoft stores the password hashes of Windows user accounts in the registry hive c:\windows\system32\config\sam. This file is highly protected and not accessible while Windows is running even for the administrator user. To circumvent the protection and access the SAM file, we need to boot from a Live CD such as BackTrack so we can hack Windows password in the SAM registry file. The method that I describe in this tutorial can works with any computer running Windows 7/Vista/XP system. To get started, you need to download a live edition of BackTrack Linux distribution and burn that ISO image to a CD (you could also burn BackTrack on a USB drive). Either way, you will need to boot in to Linux to hack your forgotten Windows 7/Vista/XP password. How to Hack Windows 7/Vista/XP Password Using BackTrack? 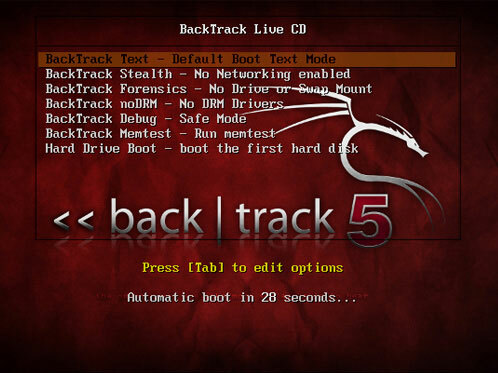 First of all boot your target computer using BackTrack Live CD or USB drive. Once Backtrack is booted, log in to the root user account using the default password: toor. Type in startx to start the GUI. Now go for Application > Privilege Escalation > Password Attacks > Offline Attack > chntpw. If your hard disk is SATA type then you need to use /sda1 instead of /hda1 in the above steps. BackTrack is widely used by most tech-savvy Linux users to hack Windows login password. But if you don’t have much experience with Linux, it’s better to use another software to hack Windows 7/Vista/XP password – Reset Windows Password, which is a Live disk based on Windows PE operating system and makes it much easier for average computer users to hack Windows password on their own. Most of us have experienced a situation where in we need to gain access to a computer which is password protected or at times we may forget the administrator password without which it becomes impossible to login to the computer. So here is an excellent hack. In this tutorial we’ll show you how to hack Windows administrator password on Windows 8/7/Vista/XP. The only requirement for this is that you need to find an alternative computer to create a password hacking Live CD. Here is a step-by-step instruction to hack Windows administrator password. Click here to download the Reset Windows Password software. Once the download is complete, unzip the download file and you’ll find the CD ISO image: ResetWindowsPwd.iso. Burn the ISO image to an empty CD using any CD/DVD recording software such as BurnCDCC or ISO2Disc. Place the Live CD you’ve created in the CD drive of your computer with the administrator password you want to hack. Head into the computer BIOS and set your computer to boot from CD. The boot procedure may take one or two minutes, and the Reset Windows Password program will start. From the main window of Reset Windows Password program, you could see the Windows SAM registry file and user accounts inside the SAM file. Choose the administrator account, and then click on the Reset Password button. It will blank your forgotten/unknown password instantly. Now remove the password hacking Lice CD and restart the computer. You can then log in to the administrator account with a blank password. This hack works even if you forgot the administrator password and can’t log in to Windows. It’s really easy to hack the login password of Windows 8/7/Vista/XP. This trick can be useful if you forgot what your login password is and want to reset/remove it so you can login again. I actually had this experience when I was trying to use my laptop which was deserted for almost a year. Here I’m going to demonstrate how to hack Windows 8/7/Vista/XP password in just a few steps, in case you forgot Windows password and can’t log on your computer. How to Hack Windows 8/7/Vista/XP Login Password? Place the Live CD you’ve created in the CD drive of your computer with a password you want to hack. Head into the computer BIOS and set your computer to boot from CD. If you don’t know how to boot into BIOS, please refer to your computer’s manual. Choose the user account whose password you want to hack, and then click on the Reset Password button. It will blank your forgotten/unknown password instantly. Eject the CD and boot your computer from local hard drive, you can immediately log on your computer with a blank password. Easy, wasn’t it? Forgetting Windows password means losing access to important files and settings on your computer. A password hint can provide clues to help you recall your password. But in most situations, we can’t recognize the importance of password hint and leave it as blank when set a new password. How to hack or recover Windows password so you can regain access to your computer? In this tutorial we’ll show you how to hack Windows password with a Linux live CD – Ophcrack, which is a freeware that can crack Windows password so you can login without making any changes to your computer. The first thing we will need to do is download the CD image from Ophcrack’s website. There are two options to download: XP or Vista. So make sure you grab the right one. The Vista download works with Windows Vista or Windows 7, and the only difference between XP and Vista is the “tables” Ophcrack uses to hack the password. Once the .iso file is downloaded, burn it to a CD using any CD/DVD burning software you like, such as BurnCDCC or ImgBurn. If you are going to be cracking your password on a computer that doesn’t have a CD drive, such as a netbook, you can also burn the ISO image to a USB flash drive using Universal USB Creator. Boot the computer from the Linux Live CD that you created. On some computers you may have to go into the BIOS settings to change the boot order or push a key to show the boot menu. Once the disk is done booting, Ophcrack should start automatically and will begin hacking the passwords for all of the users on your computer. If you have a complex password it will take a lot longer than simple passwords, and with the free tables your password may never be cracked. Once the hack is done you will see the password in plain text, write it down and reboot the machine to login. If your password isn’t hacked, you can also log in as one of the other users with admin rights and then change your password from within Windows. With the free tables available you will not be able to hack every password, but the paid tables range from $100 to $1000 so you may be better off just resetting your password with Reset Windows Password utility.